"I wanted you to know that King information has been phenomenal! They have delivered everything they promised and then some. They are the best company I have dealt with so far, and that goes as far back as my banking and insurance experiences. The other day I needed to research something back to 1935. (Prior to this project, I would have never have found the information). It took me all of 10 minutes to get the information. It was amazing!" "They found old documents that we didn't even know existed. They took every box we had, indexed the documents and re-boxed them and put all the information in a database. They helped us to determine what was historical and what was required by the state to be kept. Every document has a different retention schedule." "Our records storage was in several different branches and not the best organized. There were access issues and different filing methods at each location, leading to wasted time trying to locate and coordinate records. KIS brought ease of access and centralization to our record retention process, as well as clearly defined referencing! 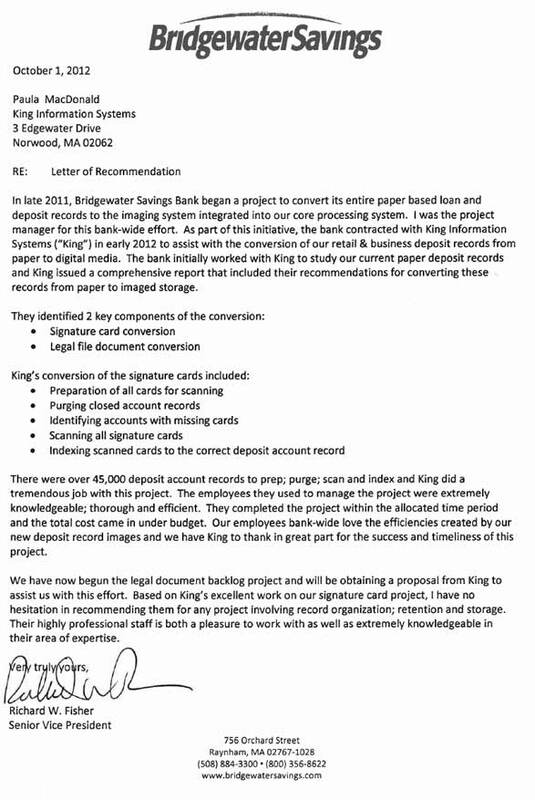 Not only did they systemize our paper records, but they helped the organization to eliminate dated records and microfilm/microfiche that we had kept much too long. We are now proud to show off our "new and improved" archives system and Records Retention Program!"